Google's Cheap Cloud Storage: Worth the Price? A free Gmail account entitles you to a little over 7GB of free storage. A free Google PicasaWeb account nets you a mere 1GB. If you're sending a lot of mail and/or uploading a lot of photos, you're likely to run out of space in a hurry. Needless to say, these are some cheap, cheap deals. Five bucks for 20GB? Sign me up! Indeed, I've long shied away from using PicasaWeb, solely because I didn't want to pay $20 annually for a paltry 10GB of storage (the old rate). 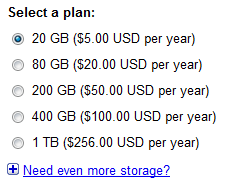 But even a cheapskate like me can swing $5, and 20GB is enough space to accommodate almost my entire photo library. It's worth noting that the additional space gets shared between your Gmail and PicasaWeb accounts, and that it gets added to the space you already have as part of your free quota.